Electronic Arts has announced an extension of its licensing deal with the National Football League, which now gives the publishing giant the right to develop and publish official NFL titles until 2013. The arrangement covers all consoles, handhelds and "console-based online features," according to a GamesIndustry report, as well as access to NFL Films and the NFL Network. "This is about bringing authenticity and realism to NFL videogames," said NFL Ventures President Eric Grubman. "EA Sports continually works to maintain the cutting edge for NFL products across a variety of gaming platforms. We like the fact that they never rest." "For nearly two decades, EA Sports has been bringing sports fans closer to the great game of football through the breakthrough interactive experiences of our videogames," added EA Sports President Peter Moore. "Game quality is our top priority, and we're committed to pushing our gameplay innovation, connecting football fans via rich online experiences and delivering the most visually stunning sports games on the market." 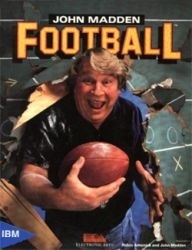 First launched in 1988 as John Madden Football, the Madden NFL franchise is one of EA Sports' top-performing game series. Madden NFL 08 has sold over 4.5 million copies since its release in August 2007, and all told the franchise has generated over $2 billion in retail sales revenue.